Be honest... when we say Nebraska, you think of corn. It's ok- no judgement here, but what if we told you there was a whole world of awesome nature, scenery, and even bizarre roadside attractions (Like Carhenge) all along one awesome drive? 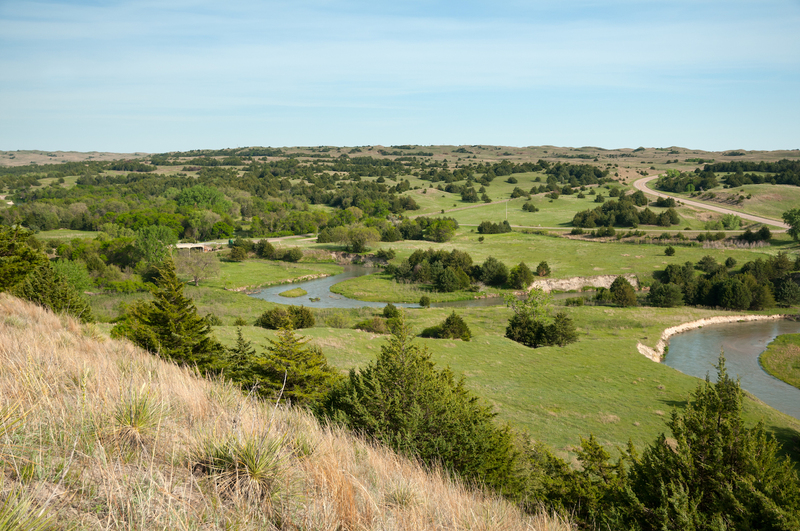 Meet the Sandhills Journey Scenic Byway. Ready to hit the road? The trip down Route 2 starts in Alliance and provides drivers with stunning views of some of the wildest land left in the United States. Known for its rolling sand hills and clear, starry nights, the Sandhills Journey Scenic Byway can be the perfect family road trip. There is little traffic, the roads are smooth and calm and the views out the window are fantastic. Before embarking on your adventure across the byway, be sure to check out the world-famous "Carhenge," which is, exactly what it sounds like. A monument to American ingenuity, Carhenge was dreamed up by Jim Reinders as a memorial to his father. It consists of a circle of cars with a heel stone, slaughter stone, and two station stones within the circle. In fact, it's a near perfect match to its counterpart across a pond, thanks to Reinder's extensive studies of Stonehenge while living in England. While it's certainly the centerpiece, the druidic tribute isn't the only strange thing on the property. There's also a "Car Art Preserve" populated with plenty of art projects created with vehicle bits and pieces, and even a little graveyard dedicated to three foreign cars buried on the grounds. A full vehicle serves as their makeshift gravestone, reading: "Here lie three bones of foreign cars. They served our purpose while Detroit slept. Now Detroit is awake and America's great!" For a unique and fun family experience, stop at the Middle Loup River and take the gang for a lazy float downstream in a rented stock tank – or a canoe or kayak if that’s more your style from Sandhills Motel & Glidden Canoe Rental. This charming little coffee shop is the perfect place to refuel after being on the road. Grab a gourmet panini, an espresso, and browse their selection of locally-made crafts and gifts. It's so cozy inside, you might spend more time here than you bargained for. The Sherman Reservoir State Recreation Area is the perfect place to stop for lunch and explore the surrounding area, stretch your legs and let the little ones fire off some pent-up road trip energy. The Stuhr Museumof the Prairie Pioneer is the coolest hands-on living history museum in the Midwest. You'll gain a new perspective and appreciation for the past as you explore the little town's church, schoolhouse, shops and more and experience what it was like to settle the plains firsthand. The Grand Island "landmark" you should stop by will leave your stomach full... It's the Coney Island Lunch Room, a 90+ year institution in Grand Island offering you a classic, greasy-spoon experience. Somewhere in between floating down the river, chatting with the locals at a diner, and cruising the byway under the impossibly bright stars, you'll probably start to realize that the prairies of Nebraska are actually a pretty magical place!